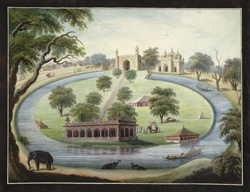 Watercolour of the Moti Jhil, 'The Pearl Lake,' near Mushidabad, by an anonymous artist working in the Murshidabad style, c. 1790-1800. Inscribed on the back in ink and pencil: 'Bird's Eye View of Mootijeel'. Murshidabad is situated on the banks of the Bhagirathi River, north of Calcutta in West Bengal. In 1704, the Nawab of Bengal transferred his capital here from Dacca; in 1757 a series of military disputes between the Nawab and the English East India Company resulted in the rise of English supremacy in Bengal. Although the town of Murshidabad continued to house the residence of the Nawab, it was no longer a place of political power. The Moti Jhil is a horseshoe-shaped lake created from a dry loop of the river that is situated about two miles south-east of Murshidabad; its grounds and pavilions were laid out by Nawazish Muhamad Khan, the nephew of Nawab 'Alivardi Khan. It was seized by Siraj al-Daula in 1756 and eventually passed into British hands. The Residents to the Murshidabad court lived here for a while, including Warren Hastings in 1761 and later Sir John Shore.